Manufactured by the THOR factory, located in a town called Mendrisio, in Canton Ticino (a "state" of Switzerland where Italian is the main language). 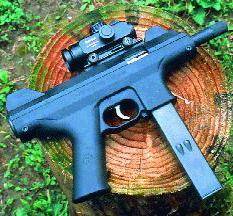 The STORM is a smg-like pistol, engineered for civilian purposes (home protection) and private security services; no full-auto fire version is scheduled to be made in future, but a "carbine version" exists, equipped with a standard polymeric buttstock. The THOR STORM has a 16-round magazine for the 9x19mm-Parabellum and 9x21mm-IMI (this one, just in Italy, because Italian law forbids the 9mm-Parabellum to be fired by civilians), and 12-rounds for the 40-SW; it was designed by ROBERTO TEPPA, an Italian engineer once working with the SITES SPA (SPA means LTD, in Italy): he was the creator of the SITES RESOLVER and FALCON pistols and the SITES SPECTRE M4 submachine gun. I don't know any version of this weapon to be scheduled for the import in the United States.